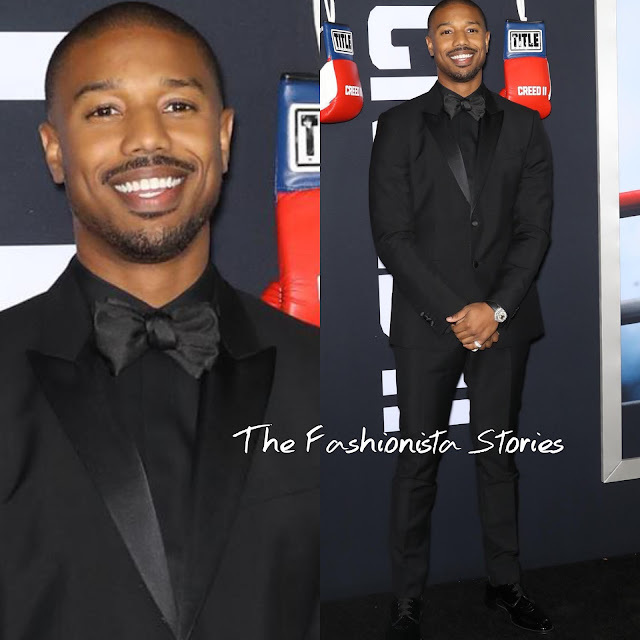 Along with Kayla Foster and co-star Tessa Thompson, Michael B. Jordan attended the Creed II premiere on Wednesday(November 14th) at the AMC Loews Lincoln Square in New York. On tune with the black carpet, the actor rocked a black GIVENCHY satin lapel, two-piece tuxedo which was styled with a black button down shirt and a black satin bow tie. A simple but classic look but the fit of the jacket could have been better. Also while I would have loved to see MBJ in this red lurex leopard jacket instead, this is not a bad look at all., especially with that smile. PIAGET & DAVID YURMAN jewelry and black shiny shoes rounded out his look.